For me, there is no doubt that great products come from great ingredients. Therefore, I have started to develop a preference for things as I moved from a naive beginner to a more experienced occupant of the kitchen. Most of the things in my kitchen come from Whole Foods, Penzey’s a regular supermarket or a local farm stand. There are a lot of ingredients, especially for baking, that you can practically anywhere. Kate’s Butter. I have used a lot of different butters, but I find I like the creaminess, the non-greasiness and flavor to be the best. I used to use only salted butter, but now I use unsalted, since most recipes call for that. I figure, I can always add all the salt I want anyway. Love that they’re local to New England! I want to support my local purveyors. Vietnamese Cinnamon. Seems weird to have a preference here, but one day when my supermarket was out I tried another kind (I believe it was Indian) and immediately upon opening the bottle recoiled in horror. This was not the cinnamon I knew– what was it? For me, there is no substitute. I do like the 365 organic, but I believe the country of origin is the most important thing for me. King Arthur Flour. Simply, the best. I have read countless blogs and articles about other types of flours, and obviously, it’s a combination of function, experience and availability. For me, KA is the champ, in all versions; all-purpose, bread, cake and whole wheat white. Not only that, they’re local to New England and their web site rocks. I have gotten a number of go-to recipes there. 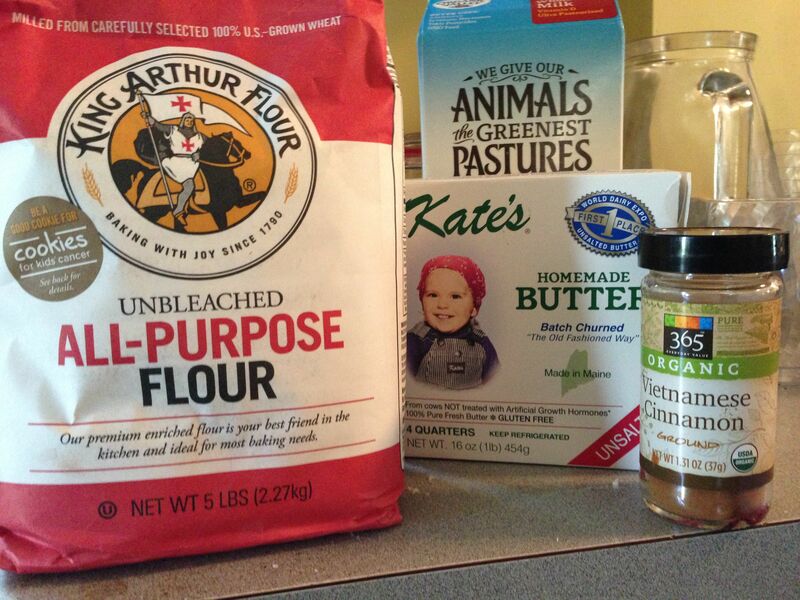 Posted in Food Writing & Other Stuff and tagged baking staples, kate's homemade butter, King Arthur Flour, new england ingredients, Robert deutsch, Vietnamese cinnamon, Whole Foods on May 11, 2014 by Robert Deutsch.